Motesanib (AMG 706) is an experimental drug candidate originally developed by Amgen but is now being investigated by theTakeda Pharmaceutical Company. It is an orally administered small molecule belonging to angiokinase inhibitor class which acts as an antagonist of VEGF receptors, platelet-derived growth factor receptors, and stem cell factor receptors. It is used as the phosphate salt motesanib diphosphate. When it has reached 1 to 2mm across, a tumor needs to grow its own blood vessels in order to continue to get bigger. Some cancer cells make a protein called vascular endothelial growth factor (VEGF). The VEGF protein attaches to receptors on cells that line the walls of blood vessels within the tumour. Some drugs block vascular endothelial growth factor (VEGF) from attaching to the receptors on the cells that line the blood vessels. This stops the blood vessels from growing. A drug that blocks VEGF is bevacizumab (Avastin). It is also a monoclonal antibody. Some drugs stop the VEGF receptors from sending growth signals into the blood vessel cells. These treatments are also called cancer growth blockers or tyrosine kinase inhibitors (TKIs). Sunitinib (Sutent) is a type of TKI that blocks the growth signals inside blood vessel cells. It is used to treat kidney cancer and a rare type of stomach cancer called gastrointestinal stromal tumour (GIST). Some drugs act on the chemicals that cells use to signal to each other to grow. This can block the formation of blood vessels. Drugs that works in this way include thalidomide and lenalidomide (Revlimid). Each drug has different side effects. You can look up the name of your drug in our cancer drug section to find out about the side effects you may have. To find trials using anti angiogenesis treatment go to our clinical trials database and type ‘angiogenesis’ into the search box. Tumors can cause their blood supply to form by giving off chemical signals that stimulate angiogenesis. Tumors can also stimulate nearby normal cells to produce angiogenesis signaling molecules. The resulting new blood vessels “feed” growing tumors with oxygen and nutrients, allowing the cancer cells to invade nearby tissue, to move throughout the body, and to form colonies of cancer cells, called metastases. Because tumors cannot grow beyond a certain size or spread without a blood supply, scientists are trying to find ways to block tumor angiogenesis. The U.S. Food and Drug Administration (FDA) has approved bevacizumab to be used alone forglioblastoma that has not improved with other treatments and to be used in combination with other drugs to treat metastatic colorectal cancer, some non-small cell lung cancers, and metastatic renal cell cancer. Bevacizumab was the first angiogenesis inhibitor that was shown to slow tumor growth and, more important, to extend the lives of patients with some cancers. The FDA has approved other drugs that have antiangiogenic activity, including sorafenib (Nexavar®), sunitinib(Sutent®), pazopanib (Votrient®), and everolimus (Afinitor®). Sorafenib is approved for hepatocellular carcinoma and kidney cancer, sunitinib and everolimus for both kidney cancer and neuroendocrine tumors, and pazopanib for kidney cancer. Initially, it was thought that angiogenesis inhibitors would have mild side effects, but more recent studies have revealed the potential for complications that reflect the importance of angiogenesis in many normal body processes, such as wound healing, heart and kidney function, fetal development, and reproduction. Side effects of treatment with angiogenesis inhibitors can include problems with bleeding, clots in the arteries (with resultant stroke or heart attack), hypertension, and protein in the urine (3–5). Gastrointestinal perforation and fistulas also appear to be rare side effects of some angiogenesis inhibitors. In addition to the angiogenesis inhibitors that have already been approved by the FDA, others that target VEGF or other angiogenesis pathways are currently being tested in clinical trials (research studies involving patients). If these angiogenesis inhibitors prove to be both safe and effective in treating human cancer, they may be approved by the FDA and made available for widespread use. In addition, phase I and II clinical trials are testing the possibility of combining angiogenesis inhibitor therapy with other treatments that target blood vessels, such as tumor-vascular disrupting agents, which damage existing tumor blood vessels (6). Oncotarget. 2011 Mar; 2(3): 122–134. More than forty anti-angiogenic drugs are being tested in clinical trials all over the world. This review discusses agents that have approved by the FDA and are currently in use for treating patients either as single-agents or in combination with other chemotherapeutic agents. Tumor angiogenesis is generation of a network of blood vessels within the cancerous growth. This process can occur two ways: The more accepted model involves the release of signaling molecules by the tumor cells; these molecules activate the surrounding tissue to promote growth of new blood vessels. This stimulates vascular endothelial cells to divide rapidly [9, 10]. The other model proposes the generation of new vasculature by vasculogenic mimicry. This model argues that the tumor cells trans-differentiate in endothelial-like cells and create structures from inside of the tumor tapping into a nearby blood vessel . Escape of the tumor cell from the confines of the primary tumor to distant body parts is the pre-requisite for hematogenous metastasis. This escape route is provided by the tumor vasculature. Thus, it was envisioned that inhibition of angiogenesis will also lead to inhibition of metastasis. This phenomenon was demonstrated by very elegant mouse model studies using angiostatin [11, 12]. Angiostatin was also demonstrated to be secreted by some primary tumors leading to restricted growth of the metastasis leading to “dormancy” of the metastasis. Mice deficient in angiogenesis (Id1 & Id3 deficient) showed significantly less tumor take rates . Independent studies showed absence of metastasis in angiogenesis deficient mice [14, 15]. Defective angiogenesis was attributed to impaired VEGF-dependent recruitment of precursor endothelial cells from the bone marrow to the newly developing tumor vasculature . Metastasis of malignant tumors to regional lymph nodes is one of the early signs of cancer spread in patients, and it occurs at least as frequently as hematogenous metastasis . Particularly, in cancers, such as breast cancer, lymphatic metastasis is a predominant route for tumor spread. The contribution of lymphatic system to the tumor growth is an area that is relatively less studied. However, lymphatic vessels are speculated to contribute to tumor growth and metastasis in a variety of ways. The VEGF, FGF2 and PDGF produced by vascular endothelial cells are proposed to be involved in the activation of lymphatic endothelial cells, which in turn produce matrix metalloproteases and urokinase plasminogen activator (uPA) that can promote malignant tumor growth. Thus, there exists a synergistic crosstalk between the tumor and the lymphatic vessels and blood vessels. Angiogenesis is a complex and intricately regulated process. Like all other regulated biological phenomena, angiogenesis has activators or pro-angiogenic factors and inhibitors or anti-angiogenic factors . Tumor cells activate signaling pathways that promote uncontrolled proliferation and survival. These include the PI3K/AKT/mTOR pathway, Hedgehog pathway and, Wnt pathway [18–24] that produce pro-angiogenic signaling intermediates [25, 26]. Among the several reported activators of angiogenesis present in cells two proteins appear to be the most important for sustaining tumor growth: vascular endothelial growth factor (VEGF) and basic fibroblast growth factor (bFGF). VEGF and bFGF are secreted by the tumor into the surrounding tissue. They bind to their cognate receptors on endothelial cells. This activates a signaling cascade that transmits a nuclear signal prompting target genes to activate endothelial cell growth. Activated endothelial cells also produce matrix metalloproteinases (MMPs). These MMPs break down the extracellular matrix and allow the migration of endothelial cells. The division and migration of the endothelial cells leads to formation of new blood vessels [27, 28]. If angiogenesis is so critical for the tumor growth, then agents that inhibit angiogenesis would have great therapeutic value. With the discovery of endostatin, the concept of anti-angiogenic therapy was launched and popularized by Dr. Folkman . Angiogenesis inhibitors have been discovered from a variety of sources. Some are naturally present in the human body e.g. specific fragments of structural proteins such as collagen or plasminogen (angiostatin, endostatin, tumstatin) . Others are natural products in green tea, soy beans, fungi, mushrooms, tree bark, shark tissues, snake venom etc. . A plethora of synthetic compounds are also characterized to have anti-angiogenic properties . e.g. Endostatin and combretastatin A4, cause apoptosis of the endothelial cells . Thalidomide is also a potent inhibitor of endothelial cell growth . e.g. anti-VEGF antibodies (Avastin, FDA approved for colorectal cancer), Interferon-alpha (inhibits the production of bFGF and VEGF) . e.g. inhibitors of MMPs . Small molecule tyrosine kinase inhibitors (TKIs) of multiple pro-angiogenic growth factor receptors. Besides these, inhibitors of mTOR (mammalian target of rapamycin), proteasome inhibitors and thalidomide have also been reported to indirectly inhibit angiogenesis through mechanisms that are not completely understood. The first FDA approved angiogenesis inhibitor, Avastin is a humanized monoclonal antibody that binds biologically active forms of vascular endothelial growth factor (VEGF) and prevents its interaction with VEGF receptors (VEGFR-1 and VEGFR-2), thereby inhibiting endothelial cell proliferation and angiogenesis. Bevacizumab has been tested in phase I studies in combination with chemotherapy with a good safety profile . This treatment is approved for metastatic colorectal cancer and non-small cell lung cancer [40–43]. Bevacizumab has also evolved as a first line of treatment in combination with paclitaxel in breast cancer patients by virtue of its ability to double median progression-free survival (PFS) . In combination with chemoendocrine therapy (including capecitabine and vinorelbine, and letrozole) bevacizumab treatment significantly decreased the percentage of viable circulating endothelial cells and prevented the chemotherapy-induced mobilization of circulating progenitors . In combination with irinotecan, bevacizumab significantly increased PFS in glioma patients [46, 47]. VEGF has emerged as a compelling therapeutic target for leukemias. Inhibition of angiogenesis in hematological malignancies interdicts the angiogenesis within the bone marrow ecosystem comprised of multiple cell types, including fibroblasts, endothelial progenitor cells, endothelial cells, dendritic cells and, malignant cells, blocking the availability of nutrients to cancer cells and disrupting crosstalk between the various cell types to curtail the malignant phenotype . This is a monoclonal antibody that binds the extracellular domain of epidermal growth factor receptor (EGFR), preventing ligand binding and activation of the receptor resulting in internalization and degradation of the receptor culminating in inhibition of cell proliferation and angiogenesis. Cetuximab downregulated VEGF expression in a dose-dependent manner in a human colorectal carcinoma (CRC) cell line and in human CRC mouse xenografts . The xenografts also showed a significant reduction in blood vessel counts following several rounds of cetuximab treatment , indicating that the tumor-promoting effects of EGFR overexpression may be mediated through VEGF stimulation and tumor angiogenesis. This treatment is approved for metastatic CRC and head and neck cancer  in patients who are refractory to irinotecan-based chemotherapy. In combination with irinotecan (an inhibitor of topoisomerase I), cetuximab is the first monoclonal antibody that has been approved by the FDA as second-line treatment for metastatic colorectal cancer [51, 52]. In Phase I and Phase III trials [53, 54] cetuximab significantly improved the effects of radiotherapy in patients with unresectable (cannot be removed by surgery) squamous cell carcinoma of the head and neck (SCCHN). Cetuximab has also been shown to sensitize cells to radiation and chemotherapy, potentially through blocking EGFR nuclear import and the associated activation of DNA protein kinase enzymes necessary for repairing radiation- and chemotherapy-induced DNA damage . Compared to radiation alone, cetuximab plus radiation therapy can nearly double the median survival in patients with a certain kind of head and neck cancer that has not spread to other parts of the body  making cetuximab the only drug achieving interesting response rate in second line treatment of advanced SCCHN . Cetuximab was also found to be tolerated well in combination with cisplatin, or carboplatin, and fluorouracil [57, 58]. It is a fully humanized anti-EGFR monoclonal antibody that binds specifically to the human EGFR. Panitumumab is a recombinant human monoclonal antibody ; therefore, the risk of an infusion reaction is minimized. Vectibix® is indicated as a single agent for the treatment of EGFR-expressing, metastatic colorectal carcinoma with disease progression on or following fluoropyrimidine-, oxaliplatin-, and irinotecan-containing chemotherapy regimens [60–62]. The effectiveness of Vectibix® as a single agent for the treatment of EGFR-expressing, metastatic CRC is based on progression-free survival [63, 64]. Panitumumab is used in patients who are not responding to regimens containing fluorouracil, oxaliplatin, and irinotecan . Patients often receive panitumumab after receiving bevacizumab or cetuximab. Panitumumab can be given with FOLFOX (oxaliplatin, leucovorin, and fluorouracil) or FOLFIRI (irinotecan, leucovorin, and fluorouracil) regimens, or as a single agent. Currently no data are available that demonstrate an improvement in disease-related symptoms or increased survival with Vectibix® in colon cancer . This drug is also being tested for aerodigestive track and head and neck cancer [66, 67]. Erlotinib hydrochloride (originally coded as OSI-774) is an orally available, potent, reversible, and selective inhibitor of the EGFR (ErbB1) tyrosine kinase activity. Erlotinib hydrochloride has been approved by FDA for treatment of patients with locally advanced or metastatic NSCLC after failure of at least one prior chemotherapy regimen [79, 80]. Interesting recent studies have demonstrated that since Erlotinib and Bevacizumab act on two different pathways critical to tumor growth and dissemination, administering these drugs concomitantly may confer additional clinical benefits to cancer patients with advanced disease. This combination therapy may prove to be a viable second-line alternative to chemotherapy in patients with NSCLC . Also, for patients with locally advanced, unresectable or metastatic pancreatic carcinoma, Erlotinib has received FDA approval for the treatment in combination with gemcitabine [82, 83]. Erlotinib is also being studied in the treatment of other types of cancers. For example combination of Erlotinib with Bevacizumab has been evaluated in metastatic breast cancer , hepatocellular carcinoma  and in metastatic renal cancer  as phase II trials. Outcomes for prostate, cervical and colorectal cancers treated with Erlotinib are cautiously optimistic [87–89]. Sorafenib is an orally active inhibitor of VEGFR-1, VEGFR-2, VEGFR-3, PDGFR-β, and Raf-1 tyrosine kinase activity . It has received the approval of FDA for the treatment of patients with unresectable hepatocellular carcinoma  and advanced renal cell carcinoma . However, not all advanced hepatocellular carcinoma patients were able to tolerate sorafenib and some patients experienced tumor progression . Sorafenib has shown improvements in PFS in patients with renal cell carcinoma . It is one of the aggressively studied drugs. According to the NCI clinical trials search results, there are about 168 active clinical trials involving sorafenib in a variety of cancers. Sunitinib targets activity of multiple tyrosine kinases such as VEGFR-1, VEGFR-2, VEGFR-3, PDGFR- β, and RET . It is approved by FDA as Sunitinib malate for treating advanced (metastatic) renal cell carcinoma . It is also approved by FDA for gastrointestinal stromal tumor (GIST) in patients whose disease has progressed or who are unable to tolerate treatment with imatinib (Gleevec), the current treatment for GIST patients [95, 96]. Sunitinib has shown early evidence of anti-tumor activity in Phase II trials in US, European and Asian patients with locally advanced, unresectable and metastatic hepatocellular carcinoma. A Phase III trial of sunitinib in hepatocellular carcinoma is ongoing . According to the NCI clinical trials search results, Sunitinib is currently evaluated in about 150 active clinical trials. It is evaluated for ovarian , breast  and non small cell lung cancer  among others . mTOR plays a part in the PI3 kinase/AKT pathway involved in tumor cell proliferation and angiogenesis . Rapamycin and related mTOR inhibitors inhibit endothelial cell VEGF expression, as well as VEGF-induced endothelial cell proliferation . Inhibitors of mTOR are an important class of anti-angiogenic agents. These include: deforolimus, everolimus, rapamycin (sirolimus), and temsirolimus [104, 105]. Temsirolimus (Toricel™) is a small molecule inhibitor of mTOR, approved for treating advanced renal cell carcinoma . It is a type of rapamycin analog and a type of serine/threonine kinase inhibitor, it is also called CCI-779. In pre-clinical models combination therapy for treating breast cancer using anti-estrogen, ERA-923, and temsirolimus has been successfully tested . It is found to be highly effective against human melanoma when tested in combination with cisplatin and DTIC (in independent studies) in a SCID mouse xenotranplantation model [108, 109]. There are over 41 active studies of Temsirolimus for a variety of solid tumors . mTOR inhibition has also been strongly advocated in as a putative cancer therapeutic strategy for urologic malignancies . In a pilot study (6 patients) with imatinib-resistant CML, rapamycin induced major and minor leukocyte responses, with an observed decrease in the mRNA levels of VEGFA in circulating leukaemic cells . Combination treatments for breast cancer with aromatase inhibitor  and letrozol  are also being evaluated. Rapamycin treatment brought partial responses (>50% reduction in the absolute number of blood blasts) and stable disease in adult refractory/relapsed AML . In a recent report, Deforolimus was studied in a Phase 2 trial in pretreated patients with various hematological malignancies, including ALL, AML, CLL, CML, MDS, agnogenic myeloid metaplasia, mantle cell lymphoma and T-cell leukemia/lymphoma . Overall, 40% of deforolimus-treated patients experienced hematological improvement or stable disease. Is a proteasome inhibitor that disrupts signaling of cancer cells, leading to cell death and tumor regression. It is the first compound in its class to be used in clinical practice. It has indirect anti-angiogenic properties . While its exact mechanism is not understood, it induces the pro-apoptotic BH3-only family member NOXA in a p53 independent fashion triggering of a caspase cascade culminating in apoptosis in melanoma and myeloma cells . It is FDA-approved for the treatment of myeloma that has relapsed after two prior treatments (or where resistance has developed following the last treatment). It was also found to induce high quality responses as third line salvage therapy with acceptable toxicity in a significant proportion of homogeneously pre-treated myeloma patients with progressive disease after autologous transplantation and thalidomide. . In a Phase 3 trial involving 669 myeloma patients treated with at least one prior therapy, bortezomib increased median, improved overall survival, and increased response rate, compared with high-dose dexamethasone . In combination with doxorubicin and gemcitabine, bortezomib was also found to be effective in heavily pretreated, advanced Cutaneous T cell Lymphomas (CTCL) . Bortezomib was also reported to be active as a single agent for patients with relapsed/refractory CTCL and Peripheral T Cell Lymphoma (PTCL) with skin involvement . On the contrary, the use of bortezomib was discouraged after a phase II study revealed that found in combination with dexamethasone, bortezomib is not active in heavily pre-treated patients with relapsed Hodgkin’s lymphoma [123, 124]. Possesses immunomodulatory, anti-inflammatory, and anti-angiogenic properties, although the precise mechanisms of action are not fully understood. Thalidomide was the first angiogenesis inhibitor to demonstrate clinical efficacy in multiple myeloma [37, 125]. Specifically in myeloma, thalidomide down-regulated VEGF secretion from bone marrow endothelial cells obtained from patients with active disease. In a landmark Phase 2 clinical trial, 169 previously treated patients with refractory myeloma received thalidomide monotherapy . Partial response, was achieved in 30% of patients, and 14% achieved a complete or nearly complete remission. The survival rate at 2 years was 48%. These results led to many subsequent clinical studies of thalidomide in myeloma, leading ultimately to FDA approval of the drug in 2006, for the treatment of newly diagnosed multiple myeloma, in combination with dexamethasone. In the pivotal Phase 3 trial, the response rate in patients receiving thalidomide plus dexamethasone was 63% compared to 41% with dexamethasone alone . Long-term outcome measures, including time-to-progression (TTP) and PFS, were recently reported for a 470 patient randomized, placebo-controlled Phase 3 clinical trial of a similar protocol in newly diagnosed multiple myeloma, with comparable overall response rates . Significant increases resulted in both median TTP and median PFS for the thalidomide plus dexamethasone group versus dexamethasone alone. Thalidomide was found to be moderately tolerated and minimally effective in patients with histologically proven advanced hepatocellular carcinoma . Thalidomide provided no survival benefit for patients with multiple, large, or midbrain metastases when combined with WBRT (whole-brain radiation therapy) . On the contrary, thalidomide did not significantly add to the efficacy of the fludarabine, carboplatin, and topotecan (FCT) regimen in poor prognosis AML patients  and was also ineffective in improving prognosis or decreasing plasma VEGF levels in patients with persistent or recurrent leiomyosarcoma of the uterus . While conventional anti-angiogenic therapy is based on Maximum Tolerated Doses (MTD), the cells involved in angiogenesis may regenerate during the three- to four-week interval between cycles of the chemotherapy. Taking advantage of the fact that endothelial cells are about 10–100 times more susceptible to chemotherapeutic agents than cancer cells, therapy based on daily, oral, low-dose chemotherapeutic drugs was designed. Metronomic chemotherapy refers to the close, rhythmic administration of low doses of cytotoxic drugs, with minimal or no drug-free breaks, over prolonged periods. Metronomic therapy appears promising mainly due to the fact that its anti-angiogenic and anti-tumorigenic effects are accompanied by low toxicity, limited side effects, no need for hospitalization and allowing for feasible combinations with selective inhibitors of angiogenesis. There are several foreseeable advantages and opportunities for metronomic chemotherapy: activity against the parenchymal and stromal components, pro-apoptotic activity, reduction of the likelihood of emergence of acquired resistance, feasibility of long term administration and acceptable systemic side effects . In a pilot phase II study conducted by Correale et al  to investigate the toxicity and activity of the novel metronomic regimen of weekly cisplatin and oral etoposide in high-risk patients with NSCLC, the objective response rate was 45.2%, disease control was 58.1%, meantime to progression and survival were 9 and 13 months, respectively. Pharmacokinetic analysis showed that this regimen allowed a greater median monthly area under the curve of the drugs than conventional schedules. In a Phase I trial of metronomic dosing of docetaxel and thalidomide, of the 26 patients with advanced tumors enrolled, prolonged freedom from disease progression was observed in 44.4% of the evaluable patients . Circulating endothelial progenitor cells (EPCs) also participate in tumor angiogenesis. In a study comparing the effects of metronomic chemotherapy over conventional dose-dense chemotherapy, it was found that the numbers of circulating EPCs and the plasma levels of VEGF increased sharply, doubling pre-therapeutic levels at day 21 after conventional chemotherapy, whereas under low-dose metronomic chemotherapy, the numbers of circulating EPCs decreased significantly and VEGF plasma concentrations remained unchanged. These observations provide evidence that conventional dose-dense chemotherapy leads to rebound EPC mobilization even when given with adjuvant intention, while low-dose metronomic scheduling of cytotoxic substances such as trofosfamide may sharply reduce EPC release into the circulation. . Combined bevacizumab and metronomic oral cyclophosphamide was also discovered to be a safe and effective regimen for heavily pre-treated ovarian cancer patients . Treatment with metronomic capecitabine and cyclophosphamide in combination with bevacizumab was shown to be effective in advanced breast cancer and additionally was minimally toxic . Metronomic treatment with carboplatin and vincristine associated with fluvastatin and thalidomide significantly increased survival of pediatric brain stem tumor patients. Tumor volume showed a significant reduction accompanied by increased quality of life . Thus, given the fact that the most evident effect of selective anti-angiogenic agents (i.e. bevacizumab) is the significant prolonging of the duration of response obtainable by chemotherapy alone, with minimal possible side effects of cytotoxic agents given in association metronomic chemotherapy should be considered both as novel up-front or maintenance treatment in patients with biologically poorly aggressive advanced cancer diseases . Overall, metronomic chemotherapy was able to induce tumor stabilization and prolong the duration of clinical benefit, without much associated toxicity. Emerging evidence suggests that metronomic chemotherapy could also activate the host immune system and potentially induce tumor dormancy [141–143]. While angiogenesis as a hallmark of tumor development and metastasis is now a validated target for cancer treatment, the overall benefits of anti-angiogenic drugs from the perspective of impacting survival have left much to desire, endorsing a need for developing more effective therapeutic regimens e.g., combining anti-angiogenic drugs with established chemotherapeutic drugs [144, 145]. There are now several agents that target the tumor vasculature through different pathways, either by inhibiting formation of the tumor neovasculature or by directly targeting the mature tumor vessels. The main body of evolving evidence suggests that their effects are compounded by their synergistic use with conventional chemotherapy rather than individual agents. Anti-angiogenic drugs such as bevacizumab can bring about a transient functional normalization of the tumor vasculature. This can have an additive effect when co-administered with chemo/radiotherapy. But long term inhibition of angiogenesis reduces tumor uptake of co-administered chemotherapeutic agents. This underscores the need for discovering new targets for anti-angiogenic therapy in order to effectively prohibit angiogenesis and circumvent mechanisms that contribute to resistance mechanisms that emerge with long term use of anti-angiogenic therapies. It also warrants a need to define reliable surrogate indicators of effectiveness of the anti-angiogenic therapy as well as dependable markers for identifying the patients who are most likely to benefit from the combination of anti-angiogenic therapy and conventional chemotherapy. Several new frontiers are emerging. New advances in understanding endothelial cells, which constitute the tumor vasculature, towards developing antiangiogenic strategies are one of the important ones [146, 147]. Novel cellular targets such as integrins and microRNAs and novel treatment options such as possible use of pharmaconutrients to modulate angiogenic pathways need careful testing and evaluation [148–151]. Finally, the administration of these drugs in a metronomic schedule is likely to improve the overall response to anti-angiogenic drugs making it feasible to administer them with conventionally toxic chemotherapeutic drugs, thus increasing the armamentarium of drug combinations that can be employed for treatment. Br J Pharmacol. 2013 Oct; 170(4):712-29. Angiogenesis, a process of new blood vessel formation, is a prerequisite for tumor growth to supply the proliferating tumor with oxygen and nutrients. The angiogenic process may contribute to tumour progression, invasion and metastasis, and is generally accepted as an indicator of tumor prognosis. Therefore, targeting tumor angiogenesis has become of high clinical relevance. The current review aimed to highlight mechanistic details of anti-angiogenic therapies and how they relate to classification and treatment rationales. Angiogenesis inhibitors are classified into either direct inhibitors that target endothelial cells in the growing vasculature or indirect inhibitors that prevent the expression or block the activity of angiogenesis inducers. The latter class extends to include targeted therapy against oncogenes, conventional chemotherapeutic agents and drugs targeting other cells of the tumor micro-environment. Angiogenesis inhibitors may be used as either monotherapy or in combination with other anticancer drugs. In this context, many preclinical and clinical studies revealed higher therapeutic effectiveness of the combined treatments compared with individual treatments. The proper understanding of synergistic treatment modalities of angiogenesis inhibitors as well as their wide range of cellular targets could provide effective tools for future therapies of many types of cancer. Two major processes of blood vessel formation are implicated in the development of vascular system: vasculogenesis and angiogenesis. Vasculogenesis prevails in the embryo and refers to the formation ofde novo blood vessels by in situ differentiation of the mesoderm-derived angioblasts and endothelial precursors. Angiogenesis is the formation of new capillaries from pre-existing vessels and circulating endothelial precursors (Polverini, 2002; Chung et al., 2010; Ribatti and Djonov, 2012). Angiogenesis is a tightly controlled dynamic process that can occur physiologically in those tissues that undergo active remodeling in response to stress and hypoxia (Carmeliet, 2003; Folkman, 2007). However, it can be aberrantly activated during many pathological conditions such as cancer, diabetic retinopathy as well as numerous ischemic, inflammatory, infectious and immune disorders (Carmeliet, 2003; Ali and El-Remessy, 2009; Willis et al., 2011). Although the concept of proposing angiogenesis inhibitors as anticancer drugs received considerable skepticism when first presented by Dr. Folkman in the early 1970s (Folkman, 1971), active research in the field and subsequent clinical trials eventually resulted in US Food and Drug Administration (FDA) approval of bevacizumab for colorectal cancer in 2004 (Cohen et al., 2007). Since then, several angiogenic inhibitors have been identified. This review will provide an overview of the key mechanisms involved in tumor angiogenesis, classification of angiogenesis inhibitors as well as treatment rationales from the mechanistic point of view. Proliferating tumours tend to activate an angiogenic phenotype to fulfil their increased demand of oxygen and nutrients (Hanahan and Folkman, 1996; Carmeliet, 2005). Additionally, paracrine release of anti-apoptotic factors from activated endothelial cells in the newly formed vasculature supplies tumour cells with a survival privilege (Folkman, 2003). Consequently, in order to progress, tumors tend to activate an event called ‘angiogenic switch’ by shifting the balance of endogenous angiogenesis inducers and inhibitors towards a pro-angiogenic outcome. As a result, dormant lesion progresses into outgrowing vascularized tumor and eventually into a malignant phenotype (Hanahan and Folkman, 1996; Baeriswyl and Christofori, 2009). Hypoxia drives such imbalance through up-regulation of the transcription factor hypoxia inducible factor-1α (HIF-1α), which in turn increases the expression of many angiogenesis inducers as well as suppresses the expression of endogenous angiogenesis inhibitors (Pugh and Ratcliffe, 2003). In spite of that, accumulating evidence indicates that angiogenic cascade can be also driven by alternative HIF-1-independent pathways (Mizukami et al., 2007; Arany et al., 2008; Lee, 2013). As summarized in Table 1, the angiogenesis inducers are a wide range of mediators that include many growth factors, a plethora of cytokines, bioactive lipids, matrix-degrading enzymes and a number of small molecules (Folkman, 1995; Folkman, 2003; Lopez-Lopez et al., 2004; Bouis et al., 2006; El-Remessy et al., 2007; Bid et al., 2011; MacLauchlan et al., 2011; Murakami, 2011; Fagiani and Christofori, 2013; Qin et al., 2013). Pro-angiogenic growth factors mostly activate a series of surface receptors in a series of paracrine and autocrine loops with the VEGF-A signaling representing the critical rate-limiting step, physiologically and pathologically. VEGF-A (traditionally known as VEGF) is the most potent VEGF isoform that acts mainly on VEGF receptor 2 (VEGFR2) to mediate vascular permeability, endothelial proliferation, migration and survival (Takahashi and Shibuya, 2005; Bouis et al., 2006). In spite of the well-established master roles of VEGF signaling in literature, those processes are probably accomplished through a highly regulated interplay between VEGF and other pro-angiogenic factors. In this context, basic fibroblast growth factor (bFGF) activation of the endothelium is required for maintenance of VEGFR2 expression and the ability to respond to VEGF stimulation (Murakami et al., 2011). Similarly, sphingosine-1-phosphate (S1P), a pleiotropic bioactive lipid that can directly contribute to tumor angiogenesis (reviewed in Sabbadini, 2011), is needed for VEGF-induced blood vessel formation, indicating the cooperation between S1P and VEGF in tumor angiogenesis (Visentin et al., 2006). As a net result, the pro-angiogenic interplay of those ligands and others dominates over the activities of two dozen endogenous angiogenesis inhibitors that can be either matrix-derived inhibitors or non–matrix-derived inhibitors (Nyberg et al., 2005). The multistep angiogenic process starts with vasodilation and increased permeability of existing vessels in response to tumor cell-secreted VEGF. This is accompanied by loosening of pericytes covering mediated by angiopoietin-2 (ANG2), a ligand of tyrosine kinase with immunoglobulin-like and EGF-like domains 2 (TIE2) receptor (Bergers and Benjamin, 2003; Jain, 2003; Fagiani and Christofori, 2013). Meanwhile, many secreted matrix-degrading enzymes, such as MMPs and heparanases, function in concert to dissolve the basement membrane and to remodel the extracellular matrix (ECM) as well as to liberate more pro-angiogenic growth factors (bFGF and VEGF) from matrix heparan sulfate proteoglycans (HSPGs) respectively (Houck et al., 1992; Whitelock et al., 1996; Vlodavsky and Friedmann, 2001; Tang et al., 2005; van Hinsbergh and Koolwijk, 2008). The overall chemotactic angiogenic stimuli guide endothelial cells to migrate, to align into tube-like structures and to eventually form new blood vessels. However, such blood vessels are characterized by being disorganized, chaotic, hemorrhagic and poorly functioning (Bergers and Benjamin, 2003). The angiogenic phenotype in tumor micro-environment can further be sustained and extravagated by the recruitment of other types of stromal cells. Stromal cells such as fibroblasts, mesenchymal stem cells and various bone marrow-derived myeloid cells including macrophages, TIE2-expressing monocytes, neutrophils and mast cells contribute to tumor angiogenesis through their production of growth factors, cytokines and proteases (Murdoch et al., 2008; Joyce and Pollard, 2009; Cirri and Chiarugi, 2011). For example, in response to cancer cell-derived TGF-β, PDGF or bFGF, fibroblasts are transformed to an activated phenotype with a higher proliferative activity and myofibroblastic characteristics (Kalluri and Zeisberg, 2006; Cirri and Chiarugi, 2011). Such carcinoma-associated fibroblasts (CAFs) were shown to promote angiogenesis and metastasis by secreting large amounts of MMP-2 and MMP-9 as well as by expressing many cytokines and chemokines that resulted in immune cell infiltration (Gerber et al., 2009; Giannoni et al., 2010). Furthermore, it has been shown that PDGF-C produced by CAFs is able to elicit VEGF production from tumor cells, thereby sustaining the angiogenic shift (Crawford et al., 2009). Similarly, tumor-associated macrophages (TAMs), one of the bone marrow myeloid-derived cells, are induced to develop into polarized type II (alternatively activated or M2 macrophages), upon exposure to tumor hypoxia and tumor cell-derived cytokines (Leek et al., 2002; Rogers and Holen, 2011). M2 macrophages tend to produce many pro-angiogenic growth factors, cytokines and matrix-degrading enzymes such as VEGF, PDGF, bFGF, TNF-α, COX-2, MMP-9, MMP-7 and MMP-12 (Lewis and Pollard, 2006). From another perspective, angiogenesis may be dispensable for progression of some malignancies. For example, some tumours may co-opt pre-existent vessels as an alternative way to obtain blood supply. Vessel co-option was first described in the brain, one of the most densely vascularized organs, in which tumours may develop in earlier stages without the activation of angiogenic response (Holashet al., 1999; Leenders et al., 2002; Bergers and Benjamin, 2003; Hillen and Griffioen, 2007). In another example, hypovascularized tumors such as pancreatic ductal adenocarcinoma may involve certain adaptation to flourish in the absence of prominent angiogenesis (Bergers and Hanahan, 2008). Obviously, in both cases, tumors may be intrinsically indifferent to angiogenesis inhibitors. However, in most other cases, therapy directed towards the vasculature of solid tumors is being considered as an important direction in cancer treatment. Growth of newly formed vessels in tumor micro-environment can be inhibited directly by targeting endothelial cells in the growing vasculature or indirectly by targeting either tumor cells or the other tumor-associated stromal cells. Therefore, angiogenesis inhibitors can be classified into direct and indirect inhibitors (Kerbel and Folkman, 2002; Folkman, 2007). Direct endogenous inhibitors of angiogenesis, such as angiostatin, endostatin, arrestin, canstatin, tumstatin and others, are fragments released on proteolysis of distinct ECM molecules. Endogenous inhibitors prevent vascular endothelial cells from proliferating, migrating in response to a spectrum of angiogenesis inducers, including VEGF, bFGF, IL-8 and PDGF (Kerbel and Folkman, 2002; Abdollahi et al., 2004; Mundel and Kalluri, 2007; Ribatti, 2009). This direct anti-angiogenic effect may be mediated by interference with endothelial integrins along with several intracellular signaling pathways (Mundel and Kalluri, 2007). For example, the ability of tumstatin-derived active peptide to inhibit angiogenesis and tumour growth is associated with the expression of the adhesion receptor, αvβ3 integrin, on tumor endothelial cells (Eikesdal et al., 2008). Through binding αvβ3 integrin, full tumstatin was found to inhibit endothelial cell activation of focal adhesion kinase, PI3K, Akt, mammalian target of rapamycin (mTOR) and others (Maeshima et al., 2002). Direct targeting of those signaling pathways by endogenous inhibitors was thought to be the least likely to induce acquired drug resistance because they target endothelial cells with assumed genetic stability rather than unstable mutating tumour cells (Kerbel and Folkman, 2002). However, endostatin has not yet led to any documented benefit to patients in randomized phase III trials, or even modest activity in phase II trials (Ellis and Hicklin, 2008). Indirect inhibitors of angiogenesis classically prevent the expression or block the activity of pro-angiogenic proteins (Folkman, 2007). For example, Iressa, an EGF receptor (EGFR) TK inhibitor (TKI), blocks tumour expression of many pro-angiogenic factors; bevacizumab, a monoclonal antibody, neutralizes VEGF after its secretion from tumour cells whereas sunitinib, a multiple receptor TKI, blocks the endothelial cell receptors (VEGFR1, VEGFR2 and VEGFR3), preventing their response to the secreted VEGF (Folkman, 2007; Roskoski, 2007). In addition, this class extends to include conventional chemotherapeutic agents, targeted therapy against oncogenes and drugs targeting other cells of the tumor micro-environment (Kerbel et al., 2000; Ferrara and Kerbel, 2005). Conventional chemotherapeutic agents have been shown to have anti-angiogenic properties in addition to the ability to induce direct cancer cell death. Such chemotherapeutic agents can affect the endothelial cell population in the tumour bed during treatment cycles because they have significantly higher proliferation rates than resting endothelium outside a tumor, making them more susceptible to cytotoxic effect (Kerbel et al., 2000; Folkman, 2003). However, the cyclic treatment rationale of cytotoxic drugs allows the potential damage to the tumour vasculature to be repaired during the long breaks. Thus, continuous low doses of chemotherapeutic agents were suggested as a way to reduce side effects and drug resistance (Drevs et al., 2004). This modality is termed metronomic therapy, and clinically, it refers to the daily administration of 5–10% of the phase II-recommended dose of the chemotherapeutic agent (Penel et al., 2012). The extended use of such low doses of cytotoxic agents elicits an anti-angiogenic activity through induction of endothelial cell apoptosis and decreasing the level of circulating endothelial precursors (Hamano et al., 2004; Shahrzad et al., 2008). In clinical investigations, metronomic dosing of cyclophosphamide and others showed promising efficacy in patients with advanced, multiple metastasized and/or multiple pretreated solid tumours (Lord et al., 2007; Fontana et al., 2010; Nelius et al., 2011; Gebbia et al., 2012; Briasoulis et al., 2013; Navid et al., 2013). VEGF-targeted therapy includes neutralizing antibodies to VEGF (e.g. bevacizumab) or VEGFRs (e.g. ramucirumab), soluble VEGFR/VEGFR hybrids (e.g. VEGF-Trap) and TKIs with selectivity for VEGFRs (e.g. sunitinib and sorafenib; Baka et al., 2006; Ellis and Hicklin, 2008; Hsu and Wakelee, 2009). Bevacizumab, a humanized monoclonal antibody against all isoforms of VEGF-A, has been approved for the treatment of colorectal, lung, glioblastoma and renal cell carcinoma (Hsu and Wakelee, 2009). Many other clinical trials with promising efficacy were also conducted in other cancers such as head and neck cancer, hepatocellular carcinoma, ovarian cancer, metastatic melanoma and gastric cancer (Argiris et al., 2011; 2013; Burger et al., 2011; Ohtsu et al., 2011; Fang et al., 2012; Minor, 2012; Schuster et al., 2012; Van Cutsem et al., 2012). However, for metastatic breast cancer, bevacizumab had been initially granted an accelerated FDA approval, which was later withdrawn due to lack of improvement evidence in disease-related symptoms or overall survival (Burstein, 2011; Montero et al., 2012). Similarly, clinical trials showed that the addition of bevacizumab to the treatment regimens of advanced pancreatic cancer did not extend overall survival (Chiu and Yau, 2012). The neutralization of VEGF-A can also be achieved by soluble receptor construct (VEGF-Trap) that monomerically ‘traps’ the different isoforms of VEGF-A, in addition to VEGF-B and placental growth factor (Rudge et al., 2007). VEGF-Trap showed clinical benefit in a phase III trial of oxaliplatin pretreated metastatic patients with colorectal cancer, and is currently being investigated in a prostate cancer phase III trial (Gaya and Tse, 2012). TKIs are small molecules with different chemical structures that have the ability to interact physically with the highly conserved kinase domain shared by different VEGFRs as well as PDGF receptors (PDGFRs), FGF receptors (FGFRs), EGFR, Raf kinases and c-Kit (a receptor of the pluripotent cell growth factor, stem cell factor). Such interaction directly inhibits tyrosine phosphorylation and the subsequent many downstream pro-angiogenic signaling networks (Baka et al., 2006; Ivy et al., 2009). Those multi-targeted TKIs demonstrated efficacy against various solid malignancies in different clinical trials, some of which have lead eventually to FDA approval of sunitinib and sorafenib. Sunitinib, known to inhibit several receptor TKs (RTKs) including VEGFR1–3, PDGFR-α, PDGFR-β, c-Kit, colony-stimulating factor-1 receptor (CSF-1R) and Flt-3, was approved for the treatment of renal cell carcinoma and gastrointestinal stromal cell tumours. Sorafenib that acts also by inhibiting VEGFR1–3 and PDGFR-β in addition to the serine–threonine kinases Raf-1, B-Raf, was approved for hepatocellular carcinoma in addition to renal cell carcinoma (Llovet et al., 2008; Ivy et al., 2009; Huang et al., 2010). FGF-targeted therapies were recently reconsidered as promising anti-angiogenic and anti-tumor agents after a long period of little attention for drug development, partly due to redundancy (Bono et al., 2013). The FGFR superfamily with its 18 ligands and four receptors has been involved in endothelial cell migration, proliferation and differentiation (Presta et al., 2005). Therapeutic targeting of FGF/FGFR signalling was accomplished by either monoclonal antibodies that inhibit FGFs binding, small molecules that inhibit FGFR TK activity or allosteric modulators that bind the extracellular FGFR domain. Monoclonal antibodies against bFGF displayed potent anti-tumor and anti-angiogenic effects in different preclinical cancer models, which warrant further clinical evaluation (Zhao et al., 2010; Wang et al., 2012). Pan inhibitors of the FGFR TKs such as AZD4547 (blocks the activity of FGFR1–3) and ponatinib (blocks all the FGFR isoforms) elicited potent anti-tumor activities in preclinical investigations so they are currently being evaluated in clinical trials. Those inhibitors displayed the greatest potency in FGFR-driven cancer models, which may be attributed to the interference with the oncogenic functions of either amplified or constitutively active FGFR (Dutt et al., 2011; Zhao et al., 2011; Gavine et al., 2012; Gozgit et al., 2012). Accordingly, further studies are needed to evaluate the relative contribution of angiogenic versus oncogenic inhibitory mechanisms towards the overall anti-tumor activity. The allosteric antagonist of the FGFR, SSR128129E, showed a strong anti-angiogenic activity in addition to tumour growth and metastasis inhibitory effects in animal models of arthritis and cancer respectively. Because allosteric modulators leave a residual level of baseline signalling, they have the ability to fine-tune target biological responses. As a result, allosteric multi-FGFR inhibitors may have an improved benefit/risk ratio that is not attainable with the other TKIs (Bonoet al., 2013; Herbert et al., 2013). However, preclinical findings suggest that long-term clinical outcomes may improve with blockade of additional pro-angiogenic RTKs that may also reduce the risk of drug resistance (Hilberg et al., 2008). For example, dual inhibition of VEGFRs and FGFRs using brivanib produced enduring tumour stasis and angiogenic blockade following the failure of VEGF-targeted therapies (Allen et al., 2011). 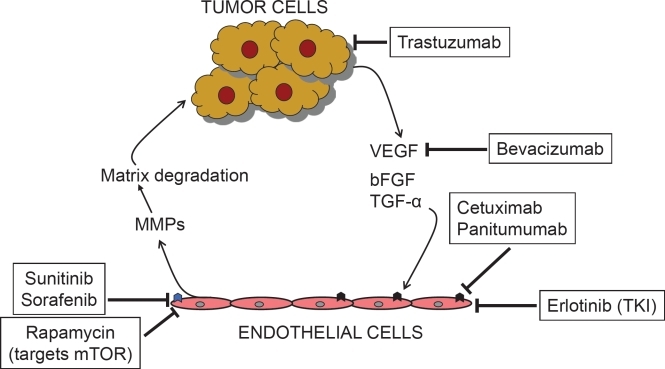 Furthermore, triple inhibition of FGFRs, VEGFRs and PDGFR(s) using dovitinib (TKI258) or nintedanib (BIBF 1120) displayed broad-spectrum anti-tumour activities in several tumour xenograft models as well as promising data in clinical trials. Combined inhibition of FGFR/VEGFR/PDGFR targets not only tumour cells, but also endothelial cells, pericytes and smooth muscle cells, resulting in an effective inhibition of tumour growth, angiogenesis and metastasis even in advanced tumour stages (Hilberg et al., 2008; Ledermann et al., 2011; Taeger et al., 2011; Chenet al., 2012; Angevin et al., 2013). Oncogenes, genes that cause the transformation of normal cells into cancerous cells, are thought to up-regulate many pro-angiogenic proteins. Therefore, anticancer drugs that were developed for their capacity to block an oncogene also have an indirect anti-angiogenic activity (Kerbel et al., 2000; Bergers and Benjamin, 2003; Folkman, 2003). For example, dasatinib and other inhibitors of sarcoma (Src), an aberrantly activated non-RTK associated with many human malignancies, showed potent anti-angiogenic effects through the down-regulation of VEGF and IL-8 (Summy et al., 2005; Han et al., 2006; Haura et al., 2010). Another example is to target the oncogenic Ras using farnesyl transferase (FT) inhibitors, which inhibit post-translational farnesylation of Ras that governs the latter’s activity (Awada et al., 2002). FT inhibitors were found to inhibit tumor VEGF expression and block FTase-dependent Ras activation, which is critically involved in VEGF-elicited angiogenic signal transduction and angiogenesis (Han et al., 2005; Izbicka et al., 2005; Kim et al., 2010). In addition to classical oncogenes inhibition, interference with other tumor-deregulated signaling pathways would offer another approach in targeting angiogenesis. For example, inhibitors of heat shock protein 90 (HSP90), a chaperone molecule known to protect oncoproteins from misfolding and degradation in the protein-rich intracellular environment, were found to prevent VEGF production and to disrupt multiple pro-angiogenic signalling pathways in numerous cancer cells. They were also shown to inhibit tumour growth and vascularity of different human tumor xenografts (Sanderson et al., 2006; Langet al., 2007; Eccles et al., 2008; Trepel et al., 2010; Moser et al., 2012). Proteasome inhibitors, such as bortezomib (PS-341) or MG-132, were also shown to reduce tumour growth and vascularity of squamous cell carcinoma and pancreatic cancer xenograft probably through inhibition of NF–κB-dependent release of pro-angiogenic gene products, VEGF and IL-8 (Sunwoo et al., 2001; Nawrocki et al., 2002; Matsuo et al., 2009). Similarly, inhibition of B-cell lymphoma 2 (Bcl-2), a prosurvival protein that regulates apoptosis by preventing the mitochondrial release of pro-apoptogenic factors, was shown to prevent NF-κB-mediated release of the pro-angiogenic factors IL-8 and CXC chemokine ligand 1 (CXCL1) as well as VEGF in tumor-associated endothelial cells and pancreatic cell lines respectively (Karl et al., 2005; Wang et al., 2008). Moreover, (−)-gossypol, a natural BH3 mimetic that inhibits BH3 domain of Bcl-2 as well as related prosurvival proteins (Bcl-xL and Mcl-1), was shown to remarkably decrease microvessel density in human prostate tumour PC-3 xenografts through decrease of VEGF and IL-8 release as well as blocking multiple steps in VEGF-activated biological events (Karaca et al., 2008; Pang et al., 2011). Matrix degrading and remodelling are activated by tumors to modify local micro-environment, which in turn promote their angiogenic potential (Bergers et al., 2000; Vlodavsky and Friedmann, 2001). Up-regulation of expression and activity of several endogenous MMPs including MMP-2, MMP-9 as well as MMP-3 and MMP-7 have been identified in invasive tumors (for a review, see Bourboulia and Stetler-Stevenson, 2010). Consequently, inhibitors of MMPs were extensively pursued as a therapeutic strategy for treating cancer. Unfortunately, MMPs intervention strategies had met with limited clinical success because of severe toxicities and associated metastasis-promoting effect (Coussens et al., 2002; Devy et al., 2009). Furthermore, the paradoxical roles of tissue inhibitors of metalloproteinases (TIMPs) may contribute to such failure depending on the net balance of TIMPs and MMPs in tumour stroma (Jiang et al., 2002). As a result, efforts were directed at therapies exploiting endogenous MMP inhibitors, TIMPs or monoclonal antibodies against individual MMPs (Martens et al., 2007; Jarvelainen et al., 2009). For example, DX-2400, a highly selective fully human MMP-14 inhibitory antibody, was found to block pro-MMP-2 processing on tumor and endothelial cells, inhibited angiogenesis, and slowed tumor progression and formation of metastatic lesions (Devy et al., 2009). Alternatively, in order to reduce toxicity and enhance drug delivery, polymeric nanoparticulate delivery systems could be used to target individual components of ECM. For example, targeted delivery of antisense inhibitors of laminin-8, a vascular basement membrane component, by conjugation to the natural drug carrier β-poly(L-malic acid) significantly reduced tumour microvessel density and increased animal survival in an experimental model of glioblastoma (Fujita et al., 2006). Similarly, a nano delivery system that incorporate peptides against proteolytically processed type IV collagen significantly accumulated in tumors and blocked angiogenesis in experimental models (Mueller et al., 2009). However, the highly sulfated oligosaccharides, Heparan (HS) mimetics highly sulfated oligosaccharides, were shown to have a heparanase-inhibiting effect sequestering, in turn, many heparan sulfate proteoglycan (HSPG)-binding factors (Johnstone et al., 2010; Dredge et al., 2011). In preclinical studies, HS mimetics have effectively targeted multiple HSPG-dependent functions and have resulted in decreased in vivo tumor growth, tumor invasion, tumor metastasis and angiogenesis (Johnstone et al., 2010; Dredge et al., 2011; Zhou et al., 2011). Clinically, the heparanase inhibitor PI-88 showed preliminary efficacy as an adjunct therapy for post-operative hepatocellular carcinoma (Liu et al., 2009). Tumour-associated stromal cells crosstalk is a perquisite for the formation of a tumour vasculature, an essential step for tumour progression (Lorusso and Ruegg, 2008). Interference with those crosstalk circuits through intervention of cellular adhesion (highlighted in next paragraph) or tumor-induced recruitment of different stromal cells may be considered as an indirect way of anti-angiogenic therapy (Ferrara and Kerbel, 2005). The latter can be supported by studies in which inhibition of macrophage infiltration, for example, by either genetic ablation of the macrophage CSF-1 or liposomal clodronate-induced macrophage depletion, was shown to delay the angiogenic switch and malignant transition (Giraudo et al., 2004; Lin et al., 2006). Furthermore, CSF-1R kinase inhibitors were found to reduce tumor-associated vascularity in two different tumor mouse models (Kubota et al., 2009; Mantheyet al., 2009). In addition, clodronate and other related bisphosphonates, originally used to treat skeletal complications in patients with tumour-induced osteolysis, were shown to exert potent anti-tumour and anti-angiogenic effects in many other studies (Fournier et al., 2002; Santini et al., 2003; Stathopoulos et al., 2008). Zoledronic acid, a third-generation bisphosphonate, was also found to reduce a number of tumour-associated macrophages and shift their phenotype from M2 to M1, resulting in a reduction in TAM-associated production of VEGF in murine models of spontaneous mammary carcinogenesis and mesothelioma (Coscia et al., 2010; Veltman et al., 2010). Clinically, repeated low-dose therapy with zoledronic acid, which maintains active drug plasma concentration, was able to induce an early remarkable and long-lasting decrease of VEGF levels in patients with cancer (Santini et al., 2007). In another example, inhibition of mobilization of neutrophils, from bone marrow and their infiltration into tumour, using neutralizing anti–prokineticin-2, an antibody against a secreted protein known also as BV8, was shown to impair the initial angiogenic switch in a multistage pancreatic beta cell tumorigenesis model (Shojaei et al., 2008). Furthermore, the neutralizing anti-BV8 was found to prevent myeloid cell-dependent tumour angiogenesis in several xenograft models (Shojaei et al., 2007). Cancer-associated fibroblasts (CAF) can also be targeted with thapsigargin analogue coupled with peptides specific for fibroblast activation protein (FAP), a CAF membrane-bound protease whose catalytic site has access to the peritumoural fluid of the tumor micro-environment. This extracellular activation results in the death of CAFs as well as pericytes and endothelial cells within milieu of different human tumor xenografts (Brennen et al., 2012). CAMs are cell surface proteins known to be involved in binding with other counter-receptors on adjacent cells or surrounding ECM macromolecules (Aplin et al., 1998). Many CAMs, such as αv-integrins, E-selectin, N-cadherin and VE-cadherin, have been implicated in tumour angiogenesis (Bischoff, 1997; Tei et al., 2002; Nakashima et al., 2003; Weis and Cheresh, 2011). For example, αv-integrins are expressed on surface of endothelial cells and can determine whether cells can adhere to and survive in a particular micro-environment. A number of matrix-derived fragments have the ability to act as endogenous angiogenesis inhibitors through binding to integrins on endothelial cells, disrupting physical connections and suppressing signalling events associated with cell survival, migration and proliferation (Nyberg et al., 2005). Consequently, integrins antagonism using peptidomimetics (e.g. cilengitide), monoclonal antibodies (e.g. volociximab) or oral small-molecule compounds have been investigated in a wide range of malignancies (Huveneers et al., 2007). Cilengitide is a cyclized pentapeptide peptidomimetic designed to compete for the arginine-glycine-aspartic acid (RGD) peptide sequence, thereby blocking the ligation of the αvβ3 and αvβ5 integrins to matrix proteins (Hariharan et al., 2007). Cilengitide is mainly under clinical development for glioblastoma; however, clinical trials of other malignancies such as head and neck cancer as well as lung cancer were also initiated (Reardon and Cheresh, 2011; Vermorken et al., 2012; Manegold et al., 2013). Alternatively, cyclic peptides containing RGD motif could guide nanoparticulate delivery system, which incorporates anti-angiogenic cytotoxic agents such as doxorubicin, paclitaxel or combretastatin A4, to accumulate specifically in tumor vasculature with no overt systemic toxicity (Murphy et al., 2008; Ruoslahti et al., 2010; Wang et al., 2011). Volociximab, a chimeric humanized monoclonal antibody that selectively inhibits the αvβ1 integrin interaction with fibronectin, has been evaluated also in clinical trials for solid tumours such as renal cell carcinoma, recurrent ovarian cancer, advanced non–small-cell lung cancer and metastatic pancreatic cancer (Figlin et al., 2006; Evans et al., 2007; Jarvelainen et al., 2009; Vergote et al., 2009; Besse et al., 2013). Cadherins constitute a superfamily of molecules that mediate calcium-dependent cell–cell adhesions. The intracellular domains of cadherins directly bind to β-catenin and link with cytoskeletal components, providing the molecular basis for stable cell–cell adhesion (Zhang et al., 2010). Targeting cadherin signalling may also represent another way for tumor angiogenesis intervention. For example, ADH-1, a cyclic pentapeptide containing the cell adhesion recognition site (His-Ala-Val) required for N-cadherin adhesion, was shown to possess anti-angiogenic and anti-tumour activity (Blaschuk et al., 2005; Blaschuk, 2012). Similarly, monoclonal antibody directed against specific region of VE-cadherin was able to inhibit tumor angiogenesis and growth with no side effects on normal vasculature (Corada et al., 2002; May et al., 2005). Targeting inflammatory angiogenesis, responsible for a substantial part of tumour vascularization initiated by infiltrating leukocytes, may be considered as another indirect anti-angiogenic strategy (Albini et al., 2005). Moreover, as mentioned before, tumour-infiltrating leukocytes contribute into malignant progression through production of many pro-inflammatory cytokines, chemokines and enzymes that can mostly induce angiogenic cascade (Balkwill et al., 2005). Such vital roles have been supported by the early observation that nonsteroidal anti-inflammatory drugs can inhibit tumour angiogenesis and, in turn, tumor progression (Albini et al., 2005). For example, ibuprofen was found to decrease tumor growth and metastatic potential in mice models through modulation of angiogenesis (Yao et al., 2005). Moreover, selective inhibitors of COX-2, an inducible enzyme that catalyses the production of prostanoids from arachidonic acid, were also shown to inhibit angiogenesis (Tsujii et al., 1998; Wei et al., 2004). The anti-angiogenic effect of COX-2 inhibitors may be contributed, in part, by decreasing the COX-2 metabolic product PGE2, the predominant PG in solid tumors known to stimulate cancer cells to produce pro-angiogenic factors such as VEGF and bFGF as well as many other factors belonging to CXC chemokines family (Strieter et al., 2004; Wang et al., 2006; Wang and Dubois, 2010). Members of the CXC chemokine family are heparin-binding proteins that possess disparate regulative roles in angiogenesis. For example, the ELR+ CXC chemokines, characterized by highly conserved three amino acid motifs (Glu-Leu-Arg; ‘ELR’ motif), are potent promoters of angiogenesis, whereas the IFN-inducible (ELR−) CXC chemokines are inhibitors of angiogenesis (Strieter et al., 2004). The use of repertaxin, originally designed to target the ELR+ CXC chemokine receptors CXCR1 and CXCR2 on neutrophils to prevent their migration to sites of inflammation, was found to inhibit tumor angiogenesis, thereby suppressing tumour progression in a genetic model of pancreatic ductal adenocarcinoma (Ijichi et al., 2011). It would be beneficial to explore other small-molecule CXCR2 antagonists that have already been developed for the treatment of inflammatory diseases in different preclinical models of cancer, especially inflammation-associated cancers (refer to Chapman et al., 2009 for a list of newly developed CXCR2 antagonists used in the treatment of inflammatory diseases of the lung). Contrary to initial expectations, treatment with angiogenesis inhibitors was associated with unexpected toxicities. The toxicity profiles of those inhibitors reflect the systemic disturbance of growth factor signalling pathways that mediate their anti-angiogenic activity (Elice and Rodeghiero, 2010; 2012). In this context, disturbance of the tight endothelial cell-platelet interaction that maintains vascular integrity results in bleeding complications, gastrointestinal perforations, and disturbed wound and ulcer healing (Verheul and Pinedo, 2007). In general, the incidence of those adverse effects increases when anti-angiogenic agent is combined with chemotherapy. For example, bleeding complications have been observed in patients with colorectal cancer treated with chemotherapy in combination with bevacizumab (Kabbinavar et al., 2003; Giantonio et al., 2006). In non–small-cell lung cancer, some patients treated with bevacizumab in combination with carboplatin and paclitaxel experienced severe or fatal pulmonary haemorrhage (Johnson et al., 2004). Furthermore, a higher incidence of gastrointestinal perforation was observed in patients with colorectal cancer given bevacizumab in combination with chemotherapy compared with chemotherapy alone (Hurwitz et al., 2004). Similarly, thrombotic events have been observed in patients treated with angiogenesis inhibitors, especially when these agents are given in combination with chemotherapy (Verheul and Pinedo, 2007). Treatment of patients with cancer with angiogenesis inhibitors is frequently associated with hypertension, which may require the addition of regular anti-hypertensive agent (Izzedine et al., 2009). Angiogenesis is a critical process that occurs pathologically in many malignancies due to changing balance of endogenous angiogenesis inducers and inhibitors, leading to the activation of nearby endothelial cells to form new vasculature. Consequently, angiogenesis can be targeted to restrict initiation, growth and progression of most of angiogenesis-dependent malignancies. Numerous angiogenic inhibitors have been identified, some of which are currently being investigated in clinical trials and some others were even approved for cancer therapies. These angiogenesis inhibitors were classified based on their target into two main classes: direct and indirect inhibitors. Indirect angiogenesis inhibitors can be further subclassified based on their interference mechanisms with the angiogenic cascade. A list of major categories and molecular targets for angiogenesis inhibitors is shown in Table 2. Most angiogenesis inhibitors conferred clinical benefits mainly when combined with other chemotherapeutic/targeted therapies rather than being used as monotherapy. Unfortunately, many anti-angiogenic agents were shown to be associated with overt systemic toxicity as well as resistance emergence and disease recurrence. Drug resistance in anti-angiogenic therapy may result from a plethora of pro-angiogenic factors released by inappropriately functioning host cells in the tumor micro-environment as a compensatory mechanism. Therefore, the strategy of targeting endothelial cells alone may not be enough as explained in the previous texts, requiring the proposal of different rationales in which other cellular compartments of tumor micro-environment are targeted to attain proper anti-angiogenic and anti-tumor response. That highlights the importance of considering tumor micro-environment as a dynamic system, as depicted in Figure 1 in which interference with any of its components may be an approach to interfere with cancer hallmarks, including angiogenesis.